Hundreds of Philippine rescuers used shovels and their bare hands Tuesday to sift through a massive landslide where dozens are feared dead in the region worst-hit by deadly Typhoon Mangkhut, as the storm's toll hit 74. The storm, 2018's most powerful, smashed homes and flooded key agricultural regions in the northern Philippines before battering Hong Kong and southern China with fierce winds and heavy rain. Hong Kong was still struggling to get back on its feet on Tuesday with a massive clean-up operation to clear broken trees, repair torn-up roads and fix damaged power lines. The violent typhoon killed four in China's southern province of Guangdong and the toll climbed on Tuesday to 74 on the Philippines' northern Luzon island according to police, with that number expected to rise. Up to 40 people are still feared buried in the landslide in Itogon, unleashed Saturday as the typhoon stalled over the area and dumped a month's worth of rain in a matter of hours. "While I said there is a 99-percent chance that all of them are dead, there is still that one-percent chance," local Mayor Victorio Palangdan told AFP. Because the slide destroyed roads, authorities have been unable to bring heavy equipment into the area to accelerate the search. As a result the teams were using human chains to extract debris. Many of those buried in Itogon were small-scale gold miners and their families who took refuge in a building abandoned by large mining firm. The Philippines has a poor record of regulating mining, with tunnel collapses and landslides in recent years regularly killing people in other gold-rush areas. "We found peace that his body has been found. We can't really do anything, it was an accident. Maybe this is God's will," Teresa Buucan told AFP after her nephew's corpse was pulled from the debris. 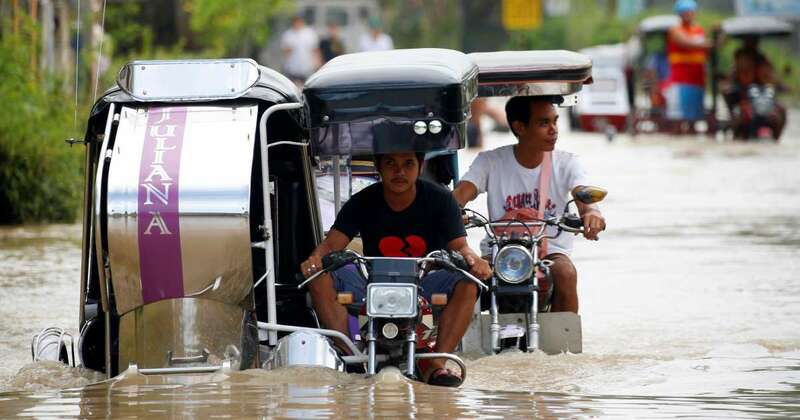 Across northern Luzon, which produces much of the nation's rice and corn, farms were under muddy floodwater. Farmers were seeing what of their crops could be saved, however, it appears the losses will total more than $100 million. That could add to the Philippines' inflation woes and worsen a spike in rice prices that has hit hard for the nearly quarter of the nation's population that survives on less than $2 a day. After a day of transport chaos in the immediate aftermath of the storm, schools were closed for a second day as authorities worked to restore rail and bus services.